The quiet ambience and home-away-from-home feeling deliver Florence the way it should be. Splurge on a suite—we love the secluded penthouse with its private terrace and view of the Duomo. Don't panic if you can't find the reception desk when you walk in and peek into the cozy sitting room where an easy chair by the fire seems to await the return of its owner, or see the mahogany table set for breakfast in the airy central courtyard—no, you haven't wandered into someone's home by mistake. There isn't a reception area exactly, merely an understated computer on a large table in the library, and the manager or concierge will be with you before you know it, welcoming you like a much-anticipated family friend. The lack of formal hotel trappings is part and parcel of the appeal of this distinctive hostelry. Counting just 20 guest rooms in a renovated building barely a stone's throw from Florence's best-known attractions, J.K. Place has an atmosphere that hovers between classic and clubby. While the bones of the house are solidly classical, from its glowing pietra serena stone floor and marble fireplaces to its red-tiled roof framing a hidden rooftop courtyard, the décor is an eclectic combination of 18th-century statuary, Moroccan and contemporary lamps, 1960s prints, couches upholstered in pin-striped suit fabric, and antique tables that evokes the sense of a place that has acquired its trappings over many generations. This is a place whose guest rooms have also acquired all the trappings of modern comfort, from fully outfitted baths to LCD TVs. 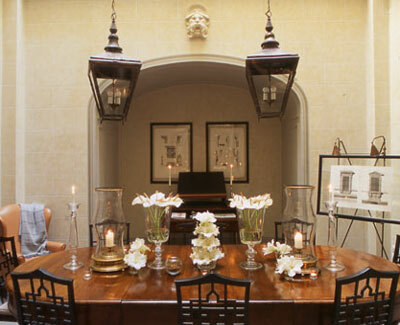 J.K. Place is about two things: this refined yet lived-in sensibility, and superb service. You won't find a raft of amenities such as restaurants, fitness rooms, or trendy shops. But who needs to work out indoors when you can walk to the Uffizi, or dine "at home" when Florence's finest restaurants are within easy reach?